Brilliant. I might just use it as a desktop background, if you don't mind. I always feel sad this time of year when the cold gets them. I get kind of fond of them strangely enough. When I see them hanging in the web on cold mornings I always come back in the hope that they are thawing out slowly and will be back again. Barry, what a compliment. Of course I don't mind. Mindy, I know exactly what you mean -- you get to know them, and to wondering how the spider brain works, to make such a beautiful thing every night and to work out that it'll be destroyed by blundering humanity if they keep making it in the same place. Consolingly, I found this lovely bit of information at the website of a local Adders garden centre: while spiders only have a lifespan of 12 months, the spiderlings of garden orb weavers like this one apparently float away like dandelion seeds on parachute-like bits of spider silk to another part of the garden for next year. You're lucky with your spiders. All I'm blessed with at the moment are Redbacks in the garage! Wow, gorgeous! I hope you call her Charlotte, after more than one canny female. Thanks all -- I'm glad people think this sight is as impressive as I thought it was when I first laid eyes on it. 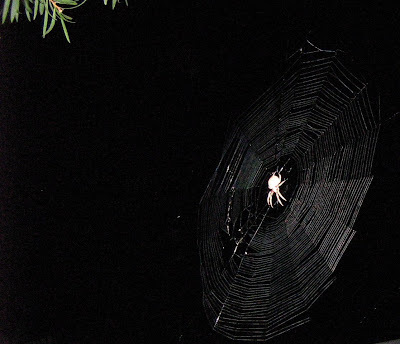 Some careful cropping has been done to eliminate next door's ugly roof line, and I almost fell into the old-fashioned gully trap and broke my leg trying to get the camera at an angle where the light from the flash would bounce off the web. Backgrounded on my computer, and looking very nice indeed. I'm not so fond of actual moving spiders, but I manage just fine as long as I can see where they are. I watched an orb weaver, weave her web in a howling wind and she did it in big broad circles, which I thought was very sensible. A few hours later the wind had dropped completely and she had re-done it all into a much tighter weave. I was very impressed. Its such a lot of work and someone told me once that at dawn, they then eat it!? Oh, and she had a mainstay coming off the tank which remained in place during the day, or was intended to. It was just above both horse-head height and mine. Eventually however Luke the horse, broke it, ravishing the briar rose where she spent her days. So I waited to see how on earth she got the line onto the tank. Did she run across the ground up the tank and back again? No, of course not, she shot gossamer threads from out of her (ahem) bum and kept shooting them until one caught. It was at least 5 metres away. I was very impressed at how strong it was and how it was strung just above our heads.